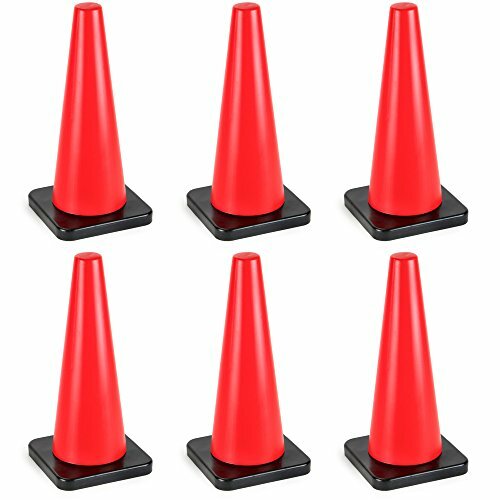 Improve performance on the field or create traffic safety zones with these multi-use cones. Measuring 18 inches, these fluorescent orange cones are highly visible from far away or on a cloudy, foggy day. Made from a soft PVC, these cones withstand extreme outdoor temperatures without breaking or cracking. Available individually or in sets of 6 and 12, they're perfect for a variety of everyday uses: athletic drills, drivers ed, animal training, parking, property hazards, and caution areas. If you coach or play a sport, field markers are a must-have piece of equipment. They're essential for improving agility in athletes of any sport: basketball, football, soccer, baseball, lacrosse, track, and more. Their durable materials can withstand indoor and outdoor training seasons, so they can be used at a gym or school all year around. These high hat cones are also ideal for creating traffic safety in schools, parking lots, businesses, and construction worksites. They are perfect for keeping pedestrians and site crews safe from hazards. And when you're done, simply stack them up for easy storage until you need them next. If you have any questions about this product by Bolthead Industrial, contact us by completing and submitting the form below. If you are looking for a specif part number, please include it with your message.